Practice Patience — When it comes to change, many times you want to get it over with and move on as quickly as possible. The cycle of change in the workplace often takes longer than you expect. The change has to be communicated, integrated, and there needs to be time for adjustment of all adjacent organizational functions. Be Adventurous — Take on the change as a challenge. Throw yourself into planning and preparation, engage others in the process, and chart out new career horizons that may appear as result of the challenge. Tap into your courageous side. 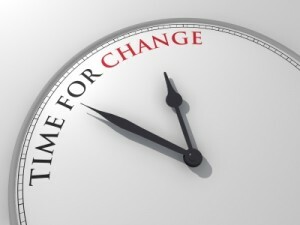 Practice constructive discontent — Instead of clinging to the status quo, ask yourself “How could I change for the better? How could the organization change for the better?” Instead of expressing discontent destructively through undermining change efforts, look for ways that the integration process of change could work even better. Try something new each day — Once you get throw out of your comfort zone, we have a tendency to try to build a new one as quickly as we can. Challenge yourself to try at least one new way of adjusting to change every day. Ask for input — Others in our organization may have insight into the ways that we can better adjust to change. Ask for ideas and suggestions and for feedback on how well you are adjusting to change. Period of change are times to build bridges, not walls. They are times to be open to input, not defensive.